Polestar has always served as Volvo Car Group’s (Volvo) performance arm, applied to the highest-performing and specially tuned models in the company’s lineup. Now, Volvo is setting Polestar up as its own brand and a direct competitor to Tesla, complete with consultative showrooms called “Spaces,” smartphone app-based business transactions, subscription rather than ownership models, and more. First out of the new Chengdu, China Polestar factory is the 2020 Polestar 1. A 2-door coupe with 2+2 seating, the Polestar 1 will be made in limited quantities. Just 500 units are planned each year, and while the price is estimated to be $155,000, you can’t buy one. You’ll subscribe to use the car for two or three years, and the monthly payment will include insurance, maintenance, valet service, and concierge service. Does Polestar’s vision of “pure, progressive performance” sound good to you? You’re going to need to get in line, because Volvo already has an impressive list of people who want to get into the Polestar 1 plug-in hybrid performance coupe. If Volvo were to make a modern C70 coupe, it would look like the Polestar 1. All of the company’s modern design themes are present and accounted for, but rendered in an edgier flavor. Polestar builds the car on Volvo’s established Scalable Platform Architecture, noting that half of the platform is original to the Polestar 1. The coupe is more than 2 feet shorter than the Volvo S90 sedan, and its major body parts are constructed using carbon fiber in order to keep weight down, improve torsional stiffness, and lower the car’s center of gravity even further for maximum handling characteristics, according to the automaker. Up front, Volvo’s signature Thor’s Hammer headlights flank a grille without adornment. The Polestar 1 has a clamshell hood, and gold brake calipers peek out from behind the oversized aluminum wheels. Based on early photos of the Polestar 1’s interior, the design is patterned after current Volvo themes. Like all modern Volvos, a large tablet-sized infotainment screen is mounted in portrait mode in the center of the dashboard, flanked by vertical air vents. Much of the switchgear appears to be plucked right from the S90 parts bin, and presumably the materials are as well. Carbon fiber trim covers the dashboard. A panoramic glass roof bathes the understated interior in natural light, and rear head restraint fairings are a subtle, sporty, and classy detail. Volvo has announced three Polestar models, two of which are pure electric vehicles. The Polestar 1, however, is a plug-in hybrid. Under the hood, powering the front wheels, resides a turbocharged and supercharged, 2.0-liter 4-cylinder gasoline engine. At the rear, dual electric motors turn the Polestar 1’s rear wheels and provide effective torque-vectoring capability. Total output measures 600 horsepower and 738 lb.-ft. of torque when all three propulsion sources are used and the car is in Power mode. Switch to Pure mode and use just the rear electric motors and the car provides 218 horsepower. Polestar promises the longest electric driving range of any plug-in hybrid, at an estimated 93 miles. “We consider it to be an electric car with support from an internal combustion engine,” said CEO of Polestar, Thomas Ingenlath. Other details include an Ohlins continuously variable damping suspension making maximum use of the car’s 48:52 front-to-rear weight distribution. Akebono braking components are also a part of the mechanical package, complete with 6-piston, gold-painted front brake calipers. Volvo has stated that its goal is to eliminate collision casualties for its customers and their passengers. 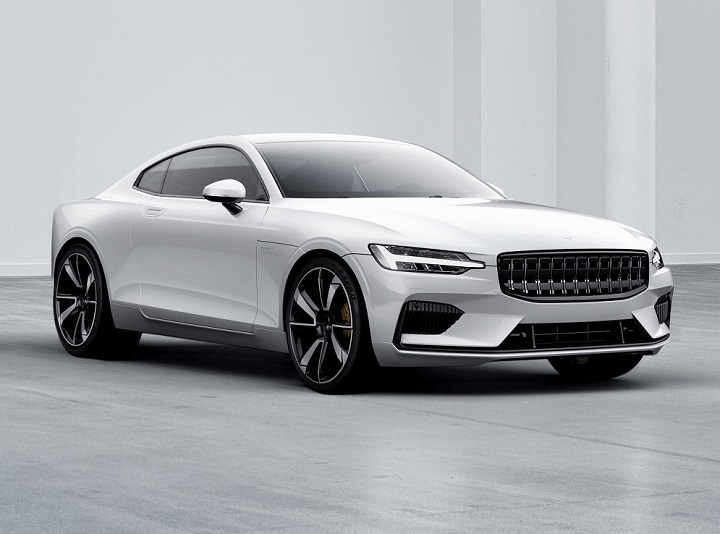 Therefore, while Polestar has not detailed specific engineering and technological safety innovations, it is a good bet that this new performance coupe will be built to perform well in this regard. When it comes to technology, aside from an up-to-date infotainment system, the Polestar 1 employs Phone as Key technology. Basically, you’ll unlock and start the car using your phone as the key.